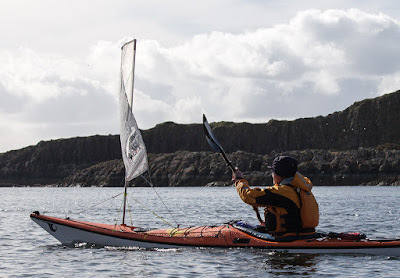 Flat Earth Kayak Sails Code Zero 0.8 long term test. For the last six months I have been extensively testing the, soon to be released in UK, Flat Earth Kayak Sails Code Zero 0.8 m2 sail. I love it! Basically it comes along every time we go out. The Code Zero sails are available in 0.75, 0.8 and 1.0 m2. In the UK they are available from Karitek. We have used the 0.8 in winds up to the top of Force 5 and I think that 0.8m2 is the perfect size for NW Europe. The 1 m2 size is popular in Australia but there are differences in the wind there. We tend to get gusty low pressure winds while nearer the tropics, steady trade winds predominate. Also the density of the air is greater in cold dry conditions. When the above photo was taken the air temp was 5C and the humidity was 10% and the air density was 1.265kg/m3. 12 hours later, my brother in Melbourne experienced 38C and a humidity of 85% and the air density was 1.107, some 13% less. Since the force on a sail is directly proportional to the denisty of air and the square of the wind speed, for a given wind speed the force on the sail will be greater in cold dry air. 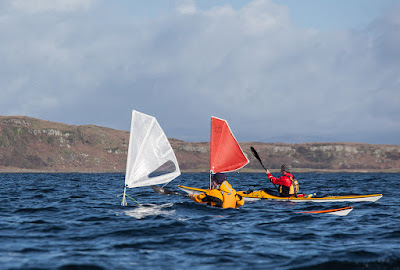 In lochs and lakes the wind speed will be less than the open sea but as it will be gustier, I still think the 0.8 m2 is the most suitable size for NW Europe kayak sailing mostly in winds of Force 2 to 5. ...the later standard 0.8sqm with 12 degrees of twist. Comparative testing has been carried out on pairs of P&H Quest and P&H Cetus kayaks. I have also used it extensively on a Nordkapp LV and also the P&H Delphin, which has proved to be a particularly potent kayak sailer. The Code Zero 0.8 is made of a dacron, spectra scrim, mylar laminate that is resistant to stretching and has low water adsorption . It is only available in white. The cut is fuller than previous sails, with a further reduction in twist in the head. The outline shape of the Code Zero 0.8 has also hanged from the Standard 0.8 design. Basically the inverted triangle formed by the mast and the main batten remains the same but the boom is now angled more steeply up. The leech between the boom and the main batten has been extended to form a roach. This extra area is supported by two mini battens, which are sewn into the leech. Overall this has reduced the area low down on the sail and increased the area higher up. The longer chord provided by the roach has increased the power of this sail for the same sized mast and boom. It has also moved it higher up into cleaner air where the sail can be more efficient. Several people in Scotland and Australia have shortened the mast and brought the tack of the sail down to nearly deck level (a cut out in the luff is then necessary to attach the stays to the mast). The idea of this is to reduce the tipping force of the sail in stronger wind. In practice, this doesn't work efficiently as the sail is working in slower, disturbed wind near the waves. My friend John altered his Standard 0.8 rig in this way and last summer, we spent an interesting afternoon comparing his modified rig with my unmodified Standard 0.8 rig on a pair of Nordkapp LV's in lively force 4 to 5 conditions on the Solway. Launching the new Code Zero sail you are immediately aware of the increase in power. In a F4 wind the Code Zero goes up with a Whumph rather than the more gentle Whuffffff of the standard sail. 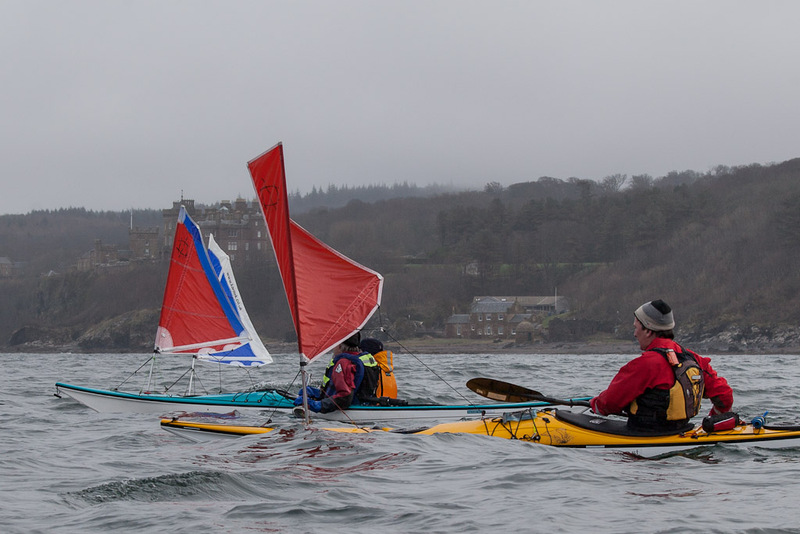 If you are launching downwind in lively conditions it is definitely worthwhile paddling hard to reduce the apparent wind before launching. I also find it easier to launch on a broad reach rather than dead down wind in stronger winds. The Code Zero 0.8 takes a nice three dimensional aerofoil shape even in light winds. It definitly gets going quicker than the Standard sail in very light winds. However, rather surprisingly it does not point so high into the wind as the Standard sail in F2-3 winds. 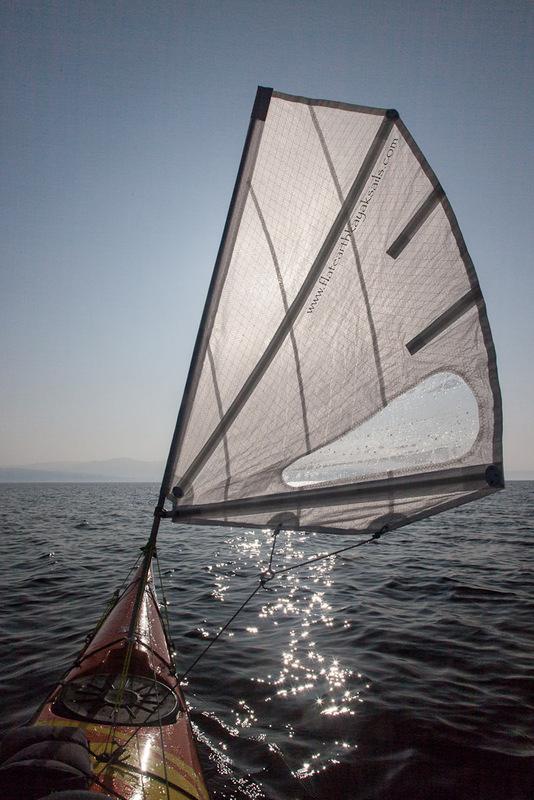 However, as the wind increases to F3-5, the Code Zero points significantly higher and travels faster than the standard sail when going up wind. Note the progressive twist in the sail from the clew to the head. The sail will point to about 68 degrees off the wind direction. Here you can see the greater degree of twist in an early Standard sail. This does give a nice soft forgiving feeling and Phil's first experience of any sailing was with this sail in a F4 wind! He survived intact and was hooked! In a way I hope the standard sails will still be available for those that like colours and a softer more forgiving feel. I have also used the Code Zero on a fully loaded Cetus MV on a three day winter bothy expedition and a five day spring camping expedition. 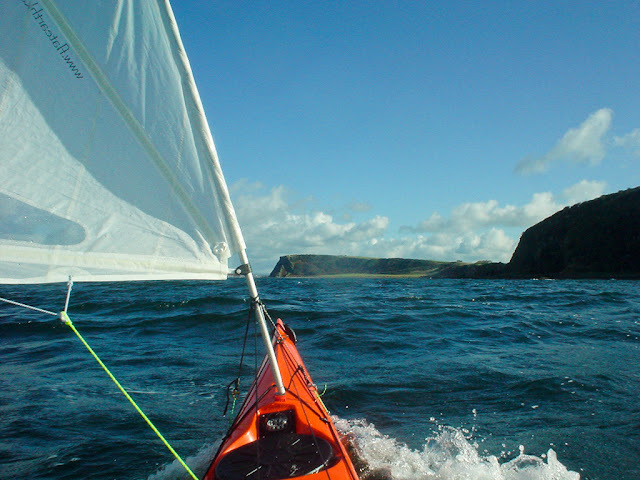 The loaded kayak obviously does not accelerate under sail power to the same extent as when day paddling. However, the help given by the sail at the end of a 44km day, when its getting dark and cold, has to be experienced to be fully appreciated! 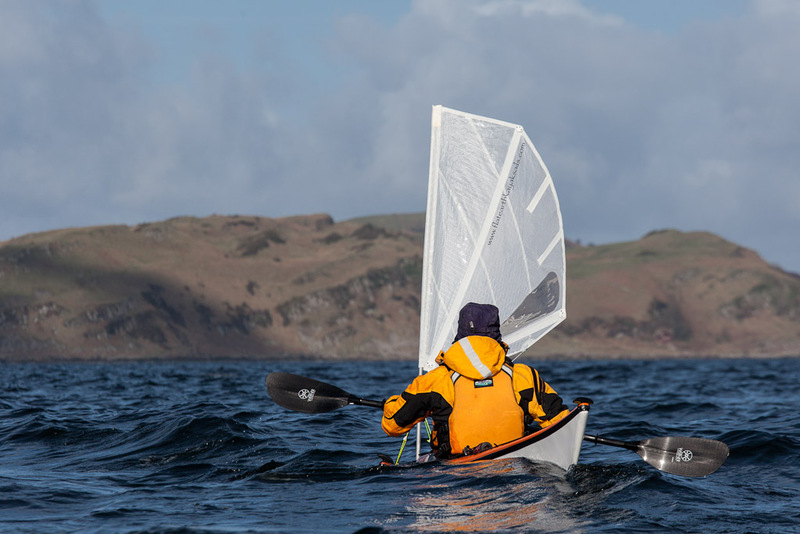 Last Sunday we paddled 14.5 km out to Ailsa Craig, an isolated island in the mouth of the Firth of Clyde. We paddled straight into a F3-4 wind and while we were on the island the wind increased to F4-5. I was using the Code Zero on a Cetus MV. 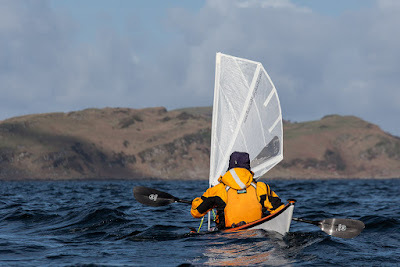 We took off like scalded cats and the Code Zero behaved impecably even in the gusty conditions in the lee of Ailsa Craig. 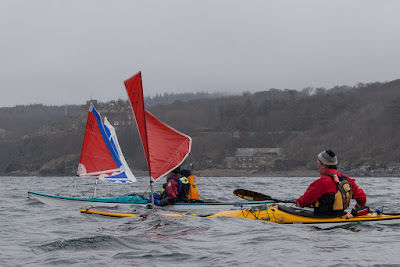 What followed was some of the finest sea kayaking fun we have ever had. Some 14km of exposure, the wind and the swell all added to the fun. The sails regularly allowed us to surf faster than the waves. Slicing up the back of a wave then surfing its front is incredible fun. We were regularly hitting 13km/hr and my maximum run was 18km/hr. At these speeds group control becomes more critical than our usual spread, so we paddled 3 abreast in tight formation and had our VHFs ready on channel 6 in case one needed to call for assistance from the others. 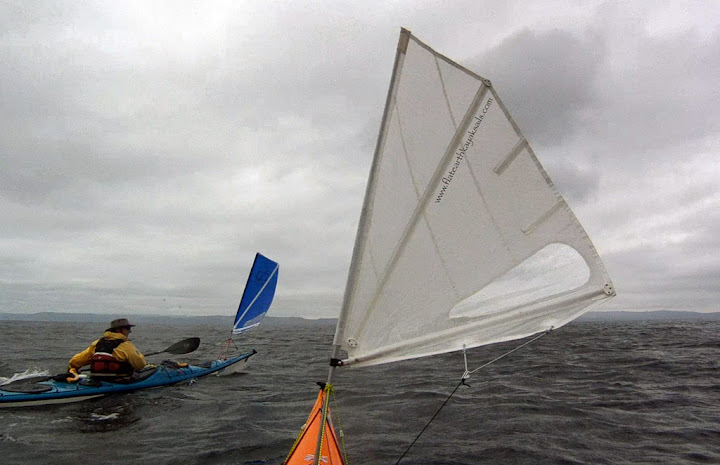 Finally, if you remain to be convinced, this short video shows the Code Zero 0.8 kayak sail in F4-5 winds along the cliffs of the south Ayrshire coast. The white material does show the dirt so it is worth keeping it clean. I have removed stains with a dilute solution of cold water and a few soap flakes. My sail has no signs of wear or delamination of the mylar backed material. The shape of the sail has not distorted with fairly extensive use. This has resolved my one quibble with the Standard sail. After extended use, the leech material can stretch a little and flutter. After testing the standard sail, I said I was blown away by it. After testing the Code Zero, it would take a hurricane to get it out of my hands. 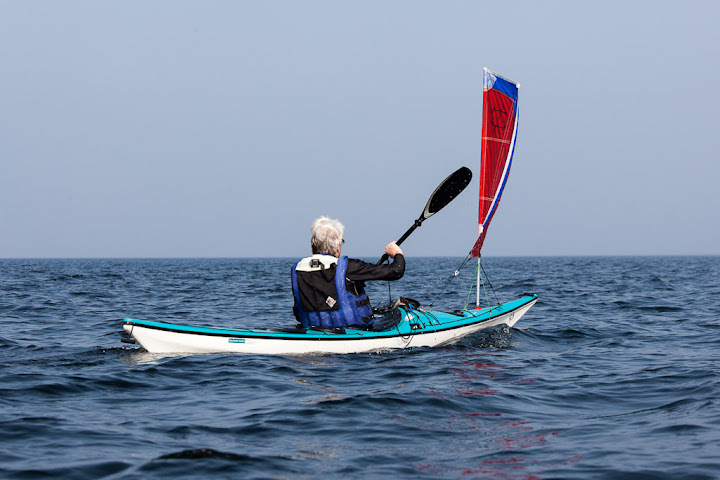 It has become such an integral part of my paddling, I cannot now imagine sea kayaking without it. Is it worth tacking upwind with a Flat Earth kayak Sail? Flat Earth Kayak Sailing Code Zero 0.8 production version test and review. I was the first person to import a FEKS into the UK. 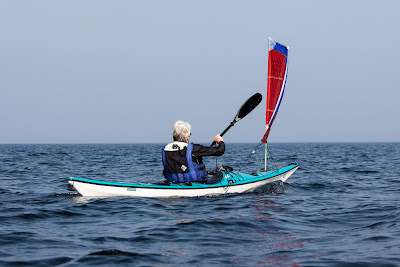 I have bought two Flat Earth Kayak Sails as a normal customer but I have also been given two sails free of charge by Mick MacRobb (the designer) for testing purposes (I had to pay UK import duty on the first). I have since given the first test sail (FoC) to a friend but I still have the use of the test Code Zero sail and lend it to others, such as Mike in the first photo above.